Zinc is a known antioxidant that maintain adequate level of metallothionein’s (MTs), is essential component of superoxide dismutase (SOD), is thiol protective, it prevents the interaction between chemical groups with iron to form free radicals, as well as acting as an inhibitor of NADPH oxidase [1-3]. So, zinc deficiency is associated with excessive free radical’s accumulation and increased DNA damage [4,5]. Many studies have shown that serum zinc levels are reduced in patients with different types of cancer as breast cancer gallbladder , lung , colon, head and neck , and bronchus [7,8]. Excess of copper has been a potent oxidant, causing the generation of ROS, in addition Copper causes both DNA damage and prevents DNA repair , also Copper activates angiogenic  that increases tumor cell invasion and metastasis . Nitric oxide and nitrogen dioxide (NO2) are two nitrogen free radicals . Various authors suggested that tumor cells utilize certain NO-mediated mechanisms for the promotion of growth, invasion and metastasis. There is also evidence that tumor-derived NO promotes tumor angiogenesis  breast carcinoma, . Markedly expressed in approximately 60% of human colon adenomas and in 20%–25% of colon carcinomas, while the expression is either low or absent in the surrounding normal tissues . These findings, together with the observation that NOS (particularly iNOS) expression levels correlate with poor clinical outcome of patients affected with different types of cancer (e.g. melanoma, breast, ovarian, head and neck and colorectal carcinoma), have led several investigators to consider NO as a potential mediator of tumor development and progression . B-chronic lymphocytic leukemia (CLL) is the most prevalent form of adult chronic leukemia. B-CLL is characterized by progressive accumulation of mature, monoclonal CD5 +ve CD19 +ve CD23 +ve B-lymphocytes in peripheral blood, lymph nodes, spleen and bone marrow. Typically, it has an indolent clinical course. However, a subset of patients experiences a more aggressive clinical course and worse prognosis . Recent insights into the pathogenesis of the disease are providing new starting points for more potent treatment options. However due to pronounced myelotoxicity those treatment regimens are reserved for physically fit patients in addition CLL is the classical leukemia of the elderly which requires tailoring the treatment according to the patient ‘s fitness and ability to tolerate more toxic combination therapies . Disturbance in the balance between oxidants and antioxidant trace element is found in different types of cancer; however, a few studies investigated the changes in copper (Cu), zinc (Zn) and nitric oxide (NO) levels in patients with CLL. This work aimed to explore the level of zinc (antioxidants) and the level of copper and nitric oxide (oxidants) and their association with treatment outcome in patients with CLL. Sample collection: Venous blood samples were collected into vacationer tubes, the clotted blood was centrifuged at 3000 rpm for 10 min, the serum was separated, and samples were stored at -80°C until the time of assay. Principle: Atoms of the element (serum zinc) vaporized when aspirated into the atomic absorption spectrometer and absorb light of the same wavelength as that emitted by the element when in the excited state. Normal serum zinc and Copper levels was 70-140 microgram % and 70-150 microgram %, respectively. Method: Levels of Zn and Cu in the serum were determined using a flame atomic absorption spectrometer (PerkinElmer model analyst 300) as previously described . For zinc both electrodeless discharge lamps (EDLs) and hollow cathode lamps provide approximately the same sensitivity and detection levels, while multielement lamps containing nickel or iron, a 0.2 nm spectral slit width was used with the copper 324.8 nm line. Data were obtained with a standard nebulizer and flow spoiler. Operation with a high sensitivity nebulizer or impact bead will typically provide a two-three times sensitivity improvement. Then deiodinase water was added to serum samples, 1:5 and 1:1 to dilute the samples for zinc and copper assay respectively. Stock standard solution was prepared by dissolving 0.500 gm of zinc metal in a minimum volume of (1+l) Hcl and diluted to 1 liter with 1% (V/V) Hcl. and dissolving 1 g of Copper metal in a minimum volume of (1+1) nitric acid (HNO3) and diluted to 1 liter with 1% (v/v) HNO3. Working zinc standards were prepared with dilution with 5% glycerol and 10% glycerol solution was used when determining Copper to approximate the viscosity characteristics and aspiration rates of the diluted plasma samples, and Absorbance was read at 324.7 and 213.9 nm for Cu and Zn, respectively. Principle: Nitric oxide (No) itself is an extremely unstable lipid soluble gas. Its determination is difficult because of its radical nature and very short halflife . Therefore, determination of the stable end products of nitric oxide (NO) as nitrite and nitrate in tissues or body fluids by an easy biochemical assay is more practical . Nitrite concentration was determined by using Griess reaction with some modification. This test depends on measuring the absorbance of the color developed upon treatment of a NO2- containing sample with Griess reagent using (Beckman DU-70 spectrophotometer Brae, USA) as previously described . The reaction was performed at room temperature (25°C). Each serum sample was diluted fourfold with distilled water and deproteinized by adding 1/20 volume of zinc sulfate (300 g/L) to give final concentration of 15 g/L . After centrifugation at 10,000xg for 5 min at room temperature, 100 microlitre of the supernatant was applied to microtitre plate well, followed by 100 microlitre of Griess reagent (prepared as: 5.8 mM sulfanilamide, 25.5 mM phosphoric acid and 537 micromol N-1-naphthylethylenedamine) as previously described . After 10 min of color development at room temperature, the absorbance was measured on Behring EL 311-microplate reader at 540 nm wavelength. Each sample was assayed in duplicate. Background activity was obtained by treating samples using 25.5 mM phosphoric acid only instead of whole Griess reagent. The standard curve was constructed using sodium nitrite concentrations ranging from 0-100 micromol/L in homogenization buffer. Normal serum nitric oxide ranged from 11.5-76.4 micromol/L in males and from 10.1-65.6 micromol/L in females. 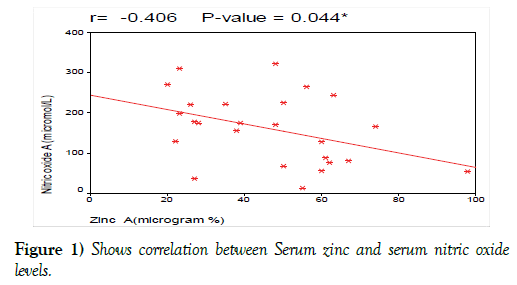 Serum zinc level had significant negative correlation with serum nitric oxide level with (r= 0-41, p<0.044, Figure 1). Figure 1: Shows correlation between Serum zinc and serum nitric oxide levels. Analysis of data was done by IBM computer using SPSS (statistical program for social science version 12). Description of quantitative variables as mean, SD and range and of qualitative variables as number and percentage. Chi-square test was used to compare qualitative variables between groups. Unpaired t-test was used to compare quantitative variables, in parametric data. Paired t-test was used to compare quantitative variable in the same group. Spearman correlation test was used to rank variables positively or inversely. One-way ANOVA test was used to compare more than two groups as regard quantitative variables. P value>0.05 is insignificant, P<0.05 is significant, P<0.01 is highly significant . Patients’ demographic and laboratory characteristic are summarized in Table 1. WBCS: white blood cells, HB: Hemoglobin, PLT: platelets count, LDH: Lactate dehydrogenase, Retics: reticulocyte count. Patients with CLL had lower Serum zinc level compared with its serum level in healthy control, after treatment the serum zinc level increased significantly compared with its pretreatment levels in patients group. (Tables 2 and 3). Table 2: Comparison between serum zinc, Copper, copper/zinc ratio and nitric oxide level in CLL patients and control subjects. Patients with CLL had higher serum level of Copper compared to its level in control subjects, after chemotherapy, the serum copper decreased significantly compared to its level at the time of diagnosis. (Tables 2 and 3). Table 3: Comparison between CLL patients as regard serum zinc, copper and nitric oxide before and after treatment. Patients with CLL had higher Cu/Zn ratio before treatment as compared to control subjects (Table 2). No significant difference was found between Cu/Zn ratio in different disease stage (Tables 4 and 5). Table 5: Comparison between serum Zinc, Copper, Nitric oxide (NO) level in CLL patients according to CD38 expression. Table 6: Comparison between zinc, copper and No levels in cll patients according to response to chemotherapy. Oxidative stress produces free radicals which are involved in the pathogenesis of many diseases including hematological malignancy . Although some possible mechanisms through which oxidative stress exerts a regulatory role in tumor growth and progression including genomic instability, oncogene activation and angiogenesis are known, several important questions remain unanswered . Patients with cancer not only have excessive oxidative stress but also altered levels of antioxidants such as SOD, catalase, vitamin E and thiols . There are contradictory results regarding the alterations in serum or tissue trace elements and concentrations of serum antioxidant protein in various cancers. The mechanisms by which these alterations occur in certain cancers need to be elucidated. It is also obscure that whether these alterations are a cause or a consequence of the malignancy . In the present study, we found that serum zinc was much lower in CLL patients compared to the control subjects, this finding agrees with the the previous studies of Beguin et al. , Beguin et al. , and Gundogdu et al. , who reported that the mean levels of plasma Zinc were significantly lower (P<0.001) in denovo CLL patients compared with controls. Modaressi et al. studied serum zinc level in patients with acute myeloid leukemia and found that serum zinc level was lower in patients as compared with healthy subjects. Yadav et al. also compared serum zinc in patients with gastrointestinal malignancies compared with healthy subjects; they found that serum zinc was much lower in patients compared with that of the control subjects. Khoshdel et al. found that mean serum zinc was lower than that of the control group in patients with colorectal cancer, these results agree with our study taking in consideration that they were working on Iranian patients with colorectal carcinoma. In addition, we compared the level of serum zinc at diagnosis with its level after 6 months of treatment and found that serum zinc levels increased significantly after treatment. However, we cannot compare our results with others as, to the best of our knowledge; no pervious study discussed the difference between zinc level before and after treatment in CLL patients. Asfour et al. found that serum zinc levels were significantly higher after chemotherapy when comparing serum zinc at diagnosis with serum zinc at D 21 of induction chemotherapy in patients with acute myeloid leukemia. Yadav et al. measured serum zincs in patients with gastrointestinal malignancies before and after treatment, they found that serum zinc increased significantly and tends toward normal after treatment. Also in the present study, we found that there was a significant negative correlation between serum zinc and disease stage this agrees to the studies of Beguin et al. , Beguin et al. , and Gundogdu et al. who found lower serum Zn in CLL patients with advanced disease stage (stage III-IV) as compared to its’ level in CLL patients with early stage (stage 0-II). We also correlated serum zinc at diagnosis with other laboratory prognostic criteria and found that; there was no significant correlation between serum zinc at diagnosis and HB level, platelets count and LDH. These results are contradictory with the results of Beguin et al. who found that serum zinc levels had a negative correlation with the Hb level, PLT count and LDH (Figure 2). In the present study, we found that serum Copper level is much higher in CLL patients compared with its’ level in the control group. These results agree with the previous studies of Beguin et al. , Gundogdu et al. , Kaiafa et al. , Labib et al. who reported that the mean levels of serum Copper were significantly higher in de novo CLL patients compared with controls (P<0.001). Mehdi et al. showed that mean copper and ceruloplasmin levels were significantly increased in cases than the control group, these results agree with our study taking into consideration that they measured serum copper and ceruloplasmin in children with acute lymphoblastic leukemia. Yadav et al. compared serum copper in patients with gastrointestinal malignancies and healthy subjects; they found that serum copper level was higher in patients than that of the healthy group control. Also, we compared the level of serum copper at diagnosis with its level after 6 months of treatment, and found that; serum copper levels remained significantly lower after treatment, these results agree with the study of Labib et al. ; who reported that the levels of serum copper were significantly lower after treatment in CLL patients (P<0.001). Yadav et al. measured serum coppers in patients with gastrointestinal malignancies before and after treatment, they found that serum copper was reduced significantly and tends toward normal after treatment. 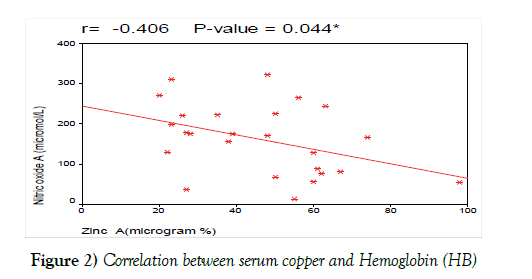 On correlation analysis between serum copper at diagnosis and parameters of the blood picture including peripheral lymphocytic count, Hb level, platelets count, we found that there was negative correlation between serum copper at diagnosis and Hb. This result agrees with the study of Labib et al. 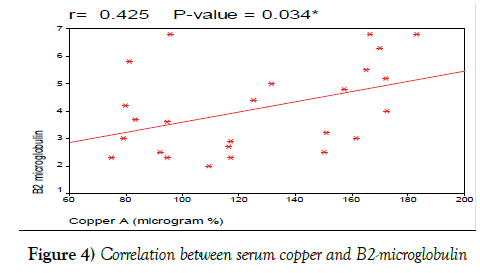 who stated that serum copper levels had a negative correlation with the Hb level. We found no correlation between lymphocyte count, platelets count and serum copper levels and this contrasts with studies done by Beguin et al. , Beguin et al. , and Labib et al. , who found a positive correlation between lymphocyte count and serum copper levels, while negative correlation was found between platelets count and serum copper levels. We also correlated serum copper at diagnosis with other prognostic laboratory tests including LDH, B2 microglobulin and CD38. 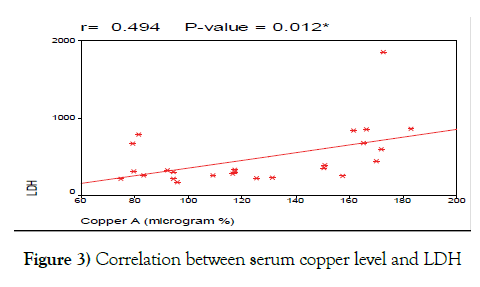 We found positive correlation between serum copper levels and LDH and this agrees with the studies done by Dohner et al., , and Labib et al. which stated that serum copper levels are positively correlated with LDH levels in CLL patients (Figure 3). We also found positive correlation between serum copper levels and B2 microglobulin and this agrees with the studies done by Keating et al. , and Labib et al. who found that serum copper levels positively correlated with levels of B2-microglobulin in CLL patients. Also, we found positive correlation between serum copper levels and CD38 and this agrees with the studies done by Schroers et al. , Kaiafa et al. , and Labib et al. which stated that serum copper levels are positively correlated with levels of CD38 expression in CLL patients (Figure 4). As regard disease stage, we correlated serum copper with stage of the disease and found that there is no significant correlation between serum copper and stage of the disease, this agrees with Labib et al. who stated that there is no significant correlation between serum copper and stage of the disease according to Rai staging system. On the other hand, our result is not in agreement with the result of Gundogdu et al. who reported that copper was higher in CLL patients with advanced stage disease (stage III- IV) as compared to patient’s early stage disease (stage 0-II). CLL patients who were nonresponsive to chemotherapy had lower serum zinc and higher serum copper levels compared with its level in responsive patients, while, NO level was not statistically different in both groups. About response to chemotherapy we found that, there was a positive correlation between serum copper after treatment with failure of treatment, this finding agrees with the study done by Labib et al. who found that serum copper was higher in patients who were nonresponsive to treatment than those who achieved response to treatment. Cu/Zn ratio before treatment was higher in CLL patients than in controls and, this agrees with the previous studies done by Beguin et al., and Beguin et al. [29,30] that stated that Cu/Zn ratio was higher in cases than in controls. In addition, Cu/Zn ratio was elevated in other types of malignancies. Modaressi et al. studied Cu/Zn ratio in patients with acute myeloid leukemia and found that Cu/Zn ratio was elevated in patients as compared with healthy subjects. Golabek et al. studied Cu/Zn ratio in patients with transitional cell carcinoma of urinary bladder and found that Cu/Zn ratio was higher in patients than that of healthy subjects. Khoshdel et al. also found that Cu/Zn ratio was higher in cases than that of the control group in patients with colorectal cancer, these results agree with our study with respect that they were working on Iranian patients with colorectal carcinoma. Yadav et al. compared Cu/Zn ratio in patients with gastrointestinal malignancies with healthy subjects; they found that Cu/Zn ratio was significantly increased in cases than the controls. In the current study, we found no significant correlation between Cu/Zn ratio and disease stage (p=0.05), this contrasts with studies done by Beguin et al. , Beguin et al. who reported that Cu/Zn ratio was positively correlated with disease stage. In the present study, we found that CLL patients had higher serum nitric oxide (NO) than the control group, this finding agrees with the study of Bakan et al. and Djurdjević et al. who found that serum No was higher in CLL patients compared to controls. Liu et al. stated that serum NO levels was higher in patients with lung cancer than the control groups, these results agree with our study with respect that this study measured serum NO in patients with lung cancer. We also found no significant difference in the level of serum NO and disease stage, these results agree with the previous studies of Bakan et al. , Djurdjević et al. .
After 6 months of chemotherapy serum nitric oxide (NO) level remained elevated compared to its’ level at the time of diagnosis. However, we cannot compare our results with others as, to the best of our knowledge; no pervious study discussed the difference between NO level before and after treatment in CLL patients. We also correlated the level of serum NO with the stage of the disease and found no significant correlation between serum NO and disease stage, these results agree with the studies of Bakan et al. , Djurdjević et al. which stated that no significant difference in NO level was found according to disease stages. This study denotes that patients with CLL had low serum zinc level (represent antioxidant agent) and high level of copper and nitric oxide (represent oxidative agent) at the time of diagnosis. After 6 month of chemotherapy serum, zinc increased and copper level decreased while No level remained significantly high. Consequently, disturbed balance of oxidant and antioxidant trace elements may play a role in disease pathogenesis and resistance to chemotherapy. We concluded that, there is a state of high oxidative stress in denovo CLL patients evidenced by increased copper and nitric oxide (NO) levels. Chemotherapy treatment resulted in increased Zinc level, decreased serum of copper, and had no effect on serum nitric oxide level. Consumption of zinc by tumor cells could explain the presence of low zinc level in CLL patients, its negative correlation with advanced disease stage, and increased level after chemotherapy. Also, interventional trial is needed to assess the effect zinc supplementation on patient`s overall survival and quality of life. In addition, we need larger studies to assess Copper levels in CLL patients with long duration of follow up to confirm the possibility of using copper as a prognostic tool equivalent to LDH, B2 -microglobulin and CD38 in CLL patients. CLL cells is known to secrete excess nitric oxide in tissue culture that cause increased expression of the mitochondrial biogenesis factors nuclear respiratory factor-1 and mitochondrial transcription factor A was elevated in most CLL specimens examined and appeared to be related to cellular NO levels and caused resistance to fludarabin . However, nitric oxide did not correlate with disease stage and its level did not normalize after chemotherapy so we need further studies to elucidate the mechanism that cause increased level of nitric oxide in patients with CLL. The dilemma of whether oxidative stress causes malignancy or malignancy causes consumption of antioxidants has not been solved and needs further researches to assess level of antioxidants and oxidative agents in blood samples as well as tissue samples. Davis SR, McMahon RJ, Cousins RJ, et al. Metallothionein knockout and transgenic mice exhibit altered intestinal processing of zinc with uniform zinc-dependent zinc transporter-1expression. J Nutr 1998;128:825-31. Tapiero H, Tew KD. Trace elements in human physiology and pathology: zinc and metallothioneins. Biomed pharmacother 2003; 57:399–411. Rahman K. Studies on free radicals, antioxidants, and cofactors. Clin Interv Aging 2007;2:219–36. Prasad AS. Zinc: Role in immunity, oxidative stress and chronic inflammation. Curr Opinion Clin Nutr Metab Care 2009;12:646–52. Jomovaa K, Valko M. Advances in metal-Induced oxidative stress and human disease. Toxicology 2011;283(2–3):65–87. Gupta SK, Singh SP, Shukla VK, et al. Copper, zinc, and Cu/Zn ratio in carcinoma of the gallbladder. J Surg Onco 2005;l91:204–08. Issell BF, Macfadyen BV, Gum ET, et al. Serum zinc levels in lung cancer patients. Cancer 2006;47:1845-48. Buntzel J, Bruns F, Glatzel M, et al. Zinc concentrations in serum during head and neck cancer progression. Anticancer Res 2007;27(4A):1941-43. Rouzer C. Metals and DNA repair, Chemical Research in Toxicology, 2010; vol. 23, no. 3, pp: 1517-18. Brewer GJ. Recognition, diagnosis and management of Wilson‘s disease. Exp Biol Med 2000;223:39-46. Vogler M, Butterworth M, Majid A, et al. Concurrent up-regulation of BCL-XL and BCL2 induces approximately 1000-fold resistance to ABT- 737 in chronic lymphocytic leukemia. Blood 2009;113:4403–10. Hordyjewska A, Popiołek Ł, Kocot J, et al. The many faces of copper in medicine and treatment. Biometals 2014; 27:611-21. Dhankhar R, Dahiya K, Singh V, et al. Nitric oxide and cancer. Journal of Clinical and Diagnostic Research. 2010;(4):2550-59. Loibl S, Von Minckwitz G, Weber S, et al. Expression of endothelial and inducible nitric oxide synthase in benign and malignant lesions of the breast and measurement of nitric oxide using electron paramagnetic resonance spectroscopy. Cancer 2002;95(6):1191-98. Nosho K, Yamamoto H, Adachi Y, et al. Gene expression profiling of colorectal adenomas and early invasive carcinomas by cDNA array analysis. Br J Cancer 2005;92(7):1193–1200. Mocellin S, Bronte V, Nitti D, et al. Nitric oxide, a double-edged sword in cancer biology: Searching for therapeutic opportunities Medicinal Research Reviews. 2007;27(3):317-52. Labib H, Hassanein M, Etewa RL, et al. Serum copper is simple but valuable prognostic marker in b-cell chronic lymphocytic leukemia. Int J Hematol 2014;100:575-81. Cramer P, Hallek M, Eichhorst B. State-of-the-art treatment and novel agents in chronic lymphocytic leukemia. Oncol Res Treat. 2016;39(1-2):25-32. Makino T, Takahara K. Direct determination of plasma copper and zinc in infants by atomic absorption with discrete nebulization. Clin Chem 1981;27:1445-47. Knowles RG, Moncada S. Nitric oxide synthases in mammals (Review). Biochem.1994;298:249-58. Kassim KS. Determination of cytosolic nitrite and nitrate as indicators of nitric oxide level in ovarian cancer cells. CMB. 1997;4: 1051-59. Moshage H, Kok B, Huizenga JR, et al. Nitrite and nitrate determinations in plasma: a clinical evaluation. Clin Chem. 1995;41:892-96. Lipinski B. Rationale for the treatment of cancer with sodium selenite. Med Hypothesis 2005;64:806-10. Blackburn RV, Spitz DR, Liu X, et al. Metabolic oxidative stress activates signal transduction and gene expression during glucose deprivation in human tumor cells. Free Radic Biol Med 1999;26:419-30. McEligot AJ, Yang S, Meyskens FL, et al. Redox regulation by intrinsic species and extrinsic nutrients in normal and cancer cells. Ann Rev Nutr 2005;25: 261-95. Gundogdu M, Kaya H, Gulcin I, et al. Oxidase activity of ceruloplasmin and some acute phase reactant and trace element concentrations in serum of patients with chronic lymphocytic leukemia. Scott Med J 2007;52:24. Beguin Y, Brasseur F, Weber G, et al. Observations of serum trace elements in chronic lymphocytic Leukemia Cancer 1987;60:1842-46. Beguin Y, Bours V, Delbrouk J, et al. Use of PIXE to measure copper, zinc, selenium, and bromine in patients with hematological malignancies. Nation Fund for scientific research. 1990;168-58. Modaressi A, Hadjibabaie M, Shamshiri A, et al. Trace elements (Se, Zn, and Cu) levels in patients with newly diagnosed acute leukemia. International Journal of Hematology Oncology and Stem Cell Research. 2012; 6(4):5-10. Yadav P, Bohra V. Significance of serum copper and zinc level in gastrointestinal cancer. J. Evid. Based Med. Health 2016; 3(13):453-56. Khoshdel Z, Naghibalhossaini F, Abdollahi K, et al. Serum copper and zinc levels among Iranian colorectal cancer patients. Biol Trace Elem Res 2016; 294-9. Asfour IA, Ayoub MS, El-Ghammaz M, et al. Zinc and malondialdehyde levels among egyptian patients with acute myeloid leukemia and their relation with disease phenotype and genotype. Egyptian journal of hematology 2015; 40(4): 153-58. Kaiafa G, Saouli Z, Diamantidis M, et al. Copper levels in patients with hematological malignancies. European Journal of Internal Medicine 2012; 23:738–41. Mehdi W, Yusof F, Mehde A, et al. Effects of acute lymphoblastic leukemia on ceruloplasmin oxidase, copper and several markers of oxidative damage, in children. Asian Pac J Cancer Prev 2015;16(13), 5205-10. Dohner H, Stilgenbauer S, Benner A, et al. Genomic aberrations and survival in chronic lymphocytic leukemia. N Engl J Med 2000;343:910–6. Keating MJ, Flinn I, Jain V, et al. Therapeutic role of alemtuzumab (Campath-1H) in patients who have failed fludarabine: Results of a large international study. Blood 2002;99:3554-61. Schroers R, Griesinger F, Trumper L, et al. Combined analysis of ZAP-70 and CD38 expression as a predictor of disease progression in B-cell chronic lymphocytic leukemia. Leukemia. 2005;19:750–8. Golabek T, Darewicz B, Borawska M, et al. Copper, zinc, and Cu/Zn ratio in transitional cell carcinoma of the bladder. Urol Int 2012;89:342-47. Djurdjevic P, Zelen I, Ristic P, et al. Oxidative stress accelerates spontaneous apoptosis of b-chronic lymphocytic leukemia lymphocytes. J BUON 2009;14(2):281-7. Bakan N, Taysi S, Yilmaz O, et al. Glutathione peroxidase, glutathione reductase, Cu–Zn superoxide dismutase activities, glutathione, nitric oxide, and malondialdehyde concentrations in serum of patients with chronic lymphocytic leukemia. Clinica Chimica Acta 2003;338(1):143-49. Liu PF, Zhao DH, Qi Y, et al. The clinical value of exhaled nitric oxide in patients with lung cancer. Clin Respir 2016;12471. Carew JS, Nawrocki ST, Xu RH, et al. Increased mitochondrial biogenesis in primary leukemia cells: the role of endogenous nitric oxide and impact on sensitivity to fludarabine. Leukemia 2004;18:1934-40.